Special Promotion for this weekend! Condition: Just upgrade your A+ class card to max level! Get FREE 100 diamonds!! Plus 3 Special Promotions to make you get rich easier! 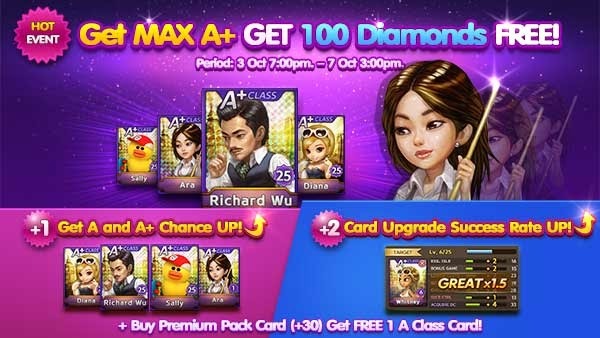 +INCREASE Chance to Get A and A+! +INCREASE Card Upgrade Success Rate! Period: 3 Oct 7:00pm - 7 Oct 3:00pm. Don’t miss this chance to get MAX POWER and be RICH in a flash! +ซื้อการ์ดพรีเมียม (+30) รับการ์ด A เพิ่มฟรี!! ระยะเวลา: 3 ต.ค. 20:00 น. - 7 ต.ค. 15.00 น.